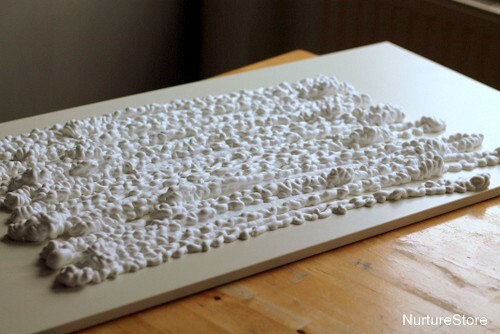 Shaving foam makes an interesting alternative to paper as a canvas to create art on. I use a old piece of shelving wood as a base when we use shaving foam, which is then really easy to pick up, take to the sink and hose down when we’re finished – super quick and easy clean up! 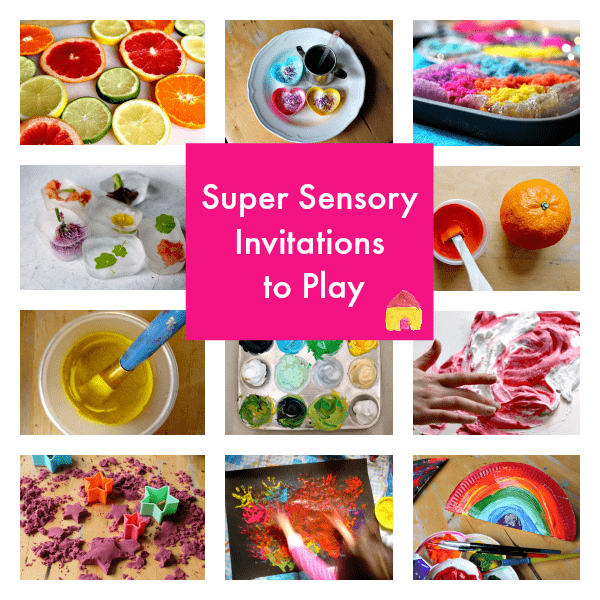 My children love all the steps involved in shaving foam sensory play and squirting out the foam at the beginning is one of their favourties. Then it was time to get hands-on. We use a washable paint so the children can get stuck in and really enjoy the sensory feel of the shaving foam and paint. Swooshing their hands to make a rainbow shape on a large scale like this really lets them enjoy the big movement of their hands and arms. This is a good gross-motor exercise which encourages wide movements, and you can try moving from your wrists, elbows or shoulders. The rainbows we made looked so pretty. 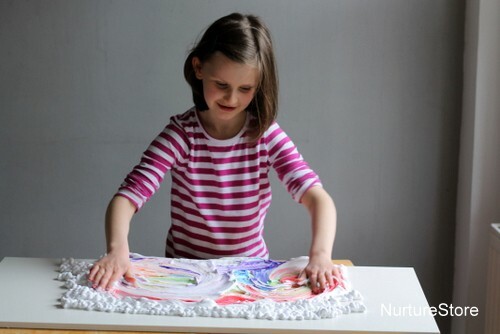 You might like to lightly press a piece of paper down on the top of the shaving foam to capture a print of your rainbow art. But we had no time for that – the children couldn’t resist swooshing and swirling the paint around. 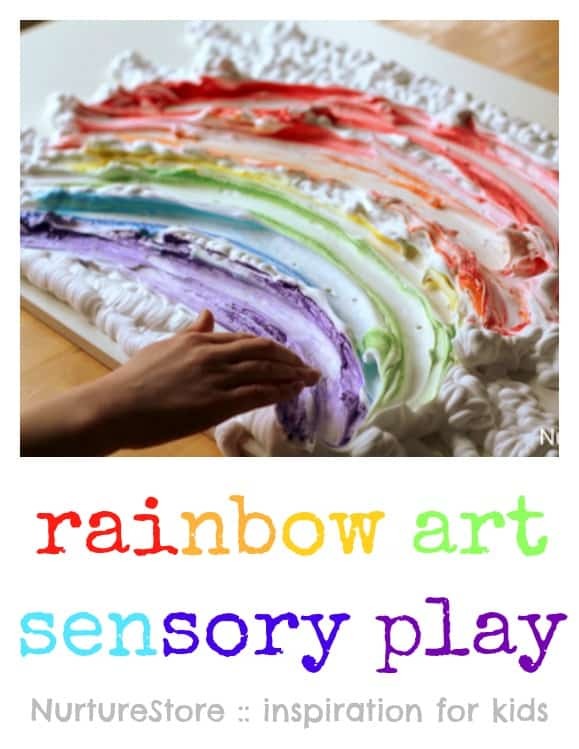 We’ve been doing lots of talking and learning about rainbows recently, so this activity was a great link to our topic, and a fun way to introduce different sensory materials to explore. 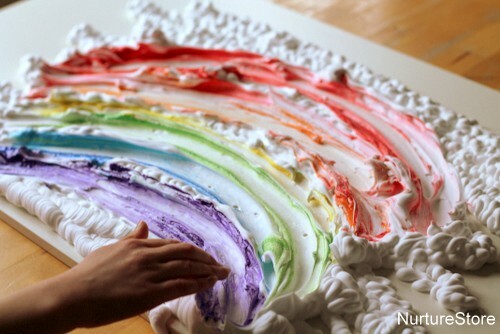 But there’s no need to control the process and feel you must only keep your colours in a neat rainbow pattern. 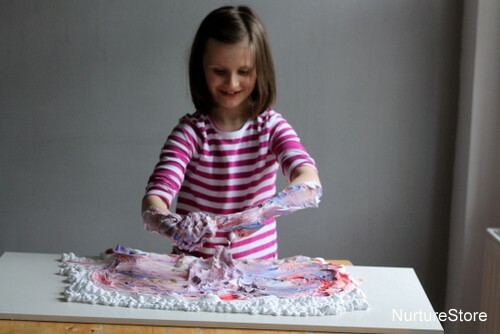 Go for it and enjoy the full process of exploring the paint and shaving foam and make lots of messy art! Lovely ideas Cathy! I really love how the painted cardboard rolls spell rainbow when put in the correct order. So simple, but so effective! Can’t believe I’ve never thought of that before. I think this is a great idea. 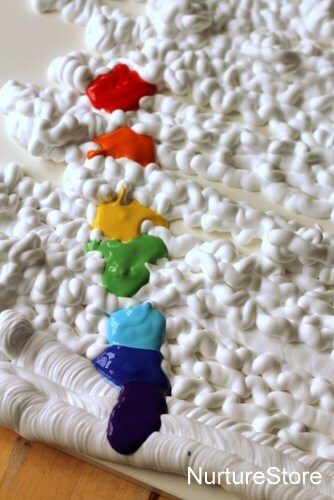 Instead of shaving cream you could use canned whip cream and food colouring so that ways it doesn’t really matter if very little people put it in their mouths (which they tend to do! ).